On June 23, 2016, I embarked on a voyage from Athens to Venice with Azamara Club Cruises. This is my first encounter with the Azamara Journey after sailing twice on her sister ship, the Azamara Quest. 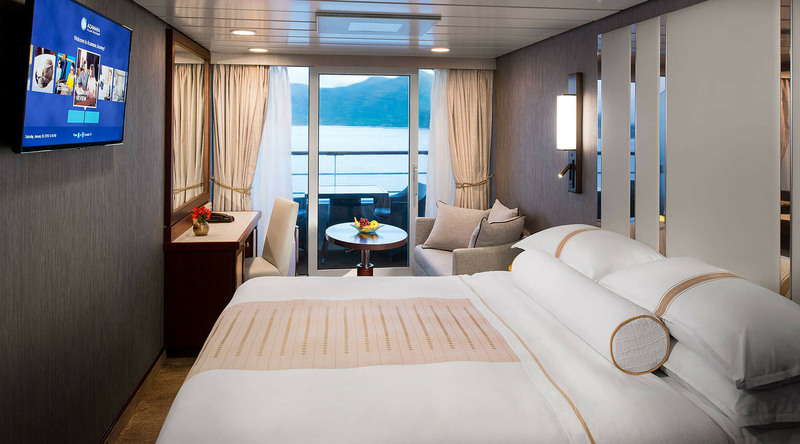 I have been following the Reimagine Azamara campaign since last year after getting a personal tour of a newly renovated suite led by Azamara's President and CEO Larry Pimentel. For me, Azamara Club Cruises has always been about the destinations, but now I am not so sure. Thanks to a major refurbishment project on Azamara Journey I am quite content to hang out on the ship enjoying the newly refreshed spaces. Before I boarded Azamara Journey I wondered how a cruise brand could innovate a good product to make it a better variation of itself. The answer is simple: listen to guest feedback and be willing to embrace change. Although new cruise guests sailing on the boutique cruise brand won’t be able to relate to the many changes that occurred during a two-week dry dock earlier this year in Nassau, Bahamas, I have made it a mission to look for every design detail, upgrade and alteration imaginable. To say that the aggressive onboard renovation project is a success is an understatement. The vibe on the ship is as light as the new color scheme, yet the same service standards and attentive staff remain unchanged. Gone are the dark colors that were indicative of country clubs and yachts clubs of the past. Instead, those dark reds and browns have been replaced with more neutral colors that lighten the ship up and serve as the perfect background for the scenery just outside the ship. There are many hidden treasures to be found on Azamara Journey. Be ready for modern décor, new technologies as well as new services and amenities. Below are a few of my favorite discoveries on Azamara Journey. The Living Room design concept is to use the space as the hub of the ship. As I read on Azamara’s website "just as the living room is the hub of your home, our Living Room is a place for just that—living." There are comfortable chairs, sofas, and quirky touches throughout the space. In the afternoon guests can hang out and enjoy tapas and wine. If traveling with a large group (or small for that matter) gather at the large wood table and enjoy friendly conversation and enjoy lite bites and a cocktail. Also, be on the lookout for one of the three "inspiration tables" that invite passengers to use the touch-screen to search for a future cruise, send a digital postcard, or just have fun with a sketching app. The Living Room is also the location for nighttime dancing and enjoying a variety of entertainment options offered by the ship. Take note as well of the antiques on display. The antiques are available for purchase but they serve as a good connection to the local area and are symbolic of the brand’s commitment to Destination Immersion®. During the daytime head up to Deck 10 for tea or coffee along with breakfast pastries, finger sandwiches, and sweets. In the afternoon (starting about 4:00 p.m.) get ready for tapas. A selection of hot and cold tapas are on the menu and the ship’s sommelier is on standby to help with pairings. One of my favorite places onboard the Azamara Journey is The Patio. By day this space (formerly known as the Pool Grill) is a great option to enjoy lunch. But as Hotel Manager Heike Berdos told me "you must eat here at night." The Patio completely transforms at night as an alternative to the dining room or specialty restaurants. The sit-down al fresco dining experience is fabulous - as I quickly learned on the third day of my cruise. I am very glad that Heike gave me the hot tip about eating at The Patio, I can foresee that as more guests learn about this hotspot, it will be harder to get a table. Not only was the food amazing (I had swordfish, grilled vegetables, and a baked potato), but the service by the staff was impeccable. Though there are ample dessert options, the new Swirl & Top self-serve frozen yogurt station is hard to ignore. Tables are set with beautiful tablecloths and LED candles in the evening. Thanks to new lighting and fans, the space is very comfortable and the setting can’t be beat. During the renovation, nothing was left untouched. I love the new stateroom décor and cabin amenities. My favorite transformation is the bed. The mattress is so comfortable that it’s hard to get motivated to wake up. New linens, bed pillows, and the new neutral color scheme create a relaxing atmosphere. There are two things in my stateroom that absolutely adore: the new bedside light that has a reading lamp and USB charger, and the shower room curtain. The bathrooms (also updated with new mirrors and flooring) are not that big (the ship is older and the size of the lavatory reflects a standard from the past). But the new shower curtain is amazing. The fabric holds its shape and creates more space in the small room. Be on the lookout for the new handpainted mural in Discoveries Restaurant. It’s the jewel in the crown of the newly reimagined space. Look for design details like new décor that incude new chairs, different sized tables, new lights, and window treatments. Window Café serves great food, especially at night when the casual eatery hosts international world cuisine. Specially crafted menus featuring regional dishes from the places Azamara cruises to are a great way to experience new cultures. The space has been transformed with new furniture and fixtures. Be sure to go outside to the Sunset Bar to enjoy the view at Windows’ outdoor dining area. I am told that the wireless access points have been upgraded on the ship. This is great news because those guests who have their smartphones at the ready will notice that there are a lot fewer dropped connections. Guests who love a good photo op will want to be on the lookout for Selfie Spots around the ship. These whimsical pop-ups are strategically placed around the ship to help guests frame the "picture postcard perfect" shot. I found out about the Selfie Spot while meandering around Deck 4, where I discovered the interactive Inspiration Center. This large plasma screen just beckons guests to touch and swipe to find their perfect new dream cruise on Azamara. Deck 4 has been freshened up and there is more space now for the concierge and loyalty and sales manager who are standing by to answer questions and to help passengers plan their next cruise adventure. Mosaic Café is still the best place on the ship for great coffee drinks and snacks. The hard working baristas probably appreciate the extra help they now have upstairs in The Living Room. Azamara certainly has done a great job helping guests connect, discover, share and indulge. It’s obvious to me that Azamara consulted with leading design consultants within the hospitality industry to exceed guests’ expectations. The new onboard product is outstanding yet the same hallmarks of service - friendly staff and a comfortable onboard atmosphere - have not changed.